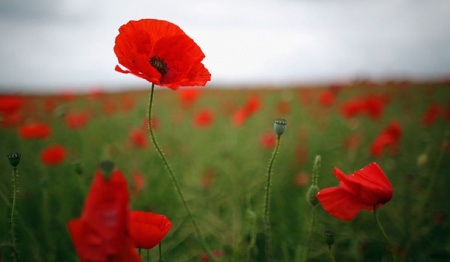 Sunday 11th of November will mark one hundred years of remembrance of the First World War 1918-2018. Oxfordshire Cricket would like to pay its respects by remembering the county cricketers that represented Oxfordshire, who lost their lives in the war. There are 7 former Oxfordshire county cricketers known to have lost their lives in the 1st World War. These players had represented the county in matches up to 1906 when the County Club folded as it was no longer deemed financially viable. The Club was resurrected in 1921 and has remained in existence from that point. Interestingly most of these men were officers in the war, reflecting the county cricket team of that period which was largely made up of amateurs. Capt. AE Bradshaw - Arthur Bradshaw came to Oxford with his family in 1897, was educated at Marlborough College, and then went to Sandhurst. He played one match for Oxfordshire in 1902. Following a few years in the army he returned to England and went up to Worcester College, Oxford in 1906. After obtaining his degree he went back into the army. In 1914 Arthur Bradshaw was serving as a Captain in the 14th Murray’s Jat Lancers of the Indian Army, and in the war was attached to the 15th (The King’s) Hussars of the British Expeditionary Force. He was killed in action in France at Bout-del-Ville, near Estaires during a reconnaissance at the age of 32 on 13 October 1914. He is buried at the Vieille-Chapelle new Military Cemetery, Lacouture (VI.C.19). Lieut-Colonel RHW Brewis - Robert Brewis was brought up in Ibstone in Oxfordshire and after his education at Harrow and Jesus College, Cambridge, he was commissioned 2/Lieutenant 4th (Militia) Battalion Oxfordshire & Buckinghamshire Light Infantry in 1892. He joined the Royal Warwickshire Regiment in 1895. In the 1st World War he served with the 2nd Battalion, The Royal Warwickshire Regiment, 22 Brigade, 7th Division. He was killed in action on 18 December 1914 at Rouges Banes during the attack on Well Farm. He was 41 and is buried in grave A 10 Sailly sur la Lys Churchyard. He had played 3 championship matches for Oxfordshire in 1897. Private GRW Dickinson - Guy Dickinson played 14 matches for the county between 1899 and 1906. As a middle order batsman he scored 374 runs at an average of 19.68 with a top score of 116 against Norfolk at Christ Church in his final season. He was born in 1877 in Yorkshire but moved to Oxfordshire when his father was appointed headmaster of the village school in Beckley, near Oxford. He served with the 54th Canadian Infantry and was killed on November 6th 1917, the last day of the third battle of Ypres. His name is recorded on the Menin Gate. Guy Dickinson was also a prominent local footballer scoring 133 goals in 197 games for Oxford City and appearing in their team that won the FA Amateur Cup in 1906. Capt. BCB Molloy - Brian Molloy was the first fatality suffered by the Queens Own Oxfordshire Hussars in the war being killed in action on 1 November 1914. He remains without a known grave in the Salient area as he was buried where he fell in 1914 near Messines. His name is commemorated on the Menin Gate. He played cricket for Henley and had one match for Oxfordshire in 1902. His brother Maurice was a more regular player for the county. Capt. FB Roberts - Francis Roberts was killed in action at St Julien, Ypres on 8th February 1916, aged 33. After leaving Rossall School, he played 9 matches for the County between 1901 and 1903 and won a blue for Cambridge University in the latter season. Between 1906 and 1914 he played 80 first-class matches for Gloucestershire scoring 2566 runs with 5 centuries and taking 88 wickets. His brother Arthur also played a couple of county championship matches for Oxfordshire. Major RO Schwartz - ‘Reggie’ Schwarz was the outstanding sportsman of this group. He was one of South Africa’s famous triumvirate of spin bowlers in this period with Vogler and Faulkner. Unusually he bowled off breaks with a leg break action but had no leg break. He also played Rugby for England before he went to South Africa. He played 6 matches for Oxfordshire in the years 1899 and 1900 with most success as a batsman, scoring 3 fifties. He later qualified for Middlesex before beginning his Test career with South Africa. He made 3 tours of England and finished with 55 wickets at an average of 25.76 in 20 Test matches. Schwarz was a major in the King's Royal Rifle Corps regiment of the British Army who fought on the Western Front in World War I. For his actions during the war he was Mentioned in Despatches and was awarded the Military Cross. He survived the war, but died in the Spanish flu epidemic in Etaples, France just seven days after the Armistice had been signed. He was 43. Major GES Young - George Young was second in command of the 1st Battalion Irish Guards when he was so badly wounded by a shell, which came through a company headquarter’s dug-out he was visiting, that he died in a hospital a fortnight later on 31st March 1917 and was buried at Grovetown cemetery. An ex-Bradfield College schoolboy he had played 3 matches for Oxfordshire in their final season of 1906.